The best of both worlds ? From Ancient Greek, πρόξενος (próksenos, "public guest"). A negotiator; a factor; a go-between. A mediator involved in immoral bargains (see pimp). 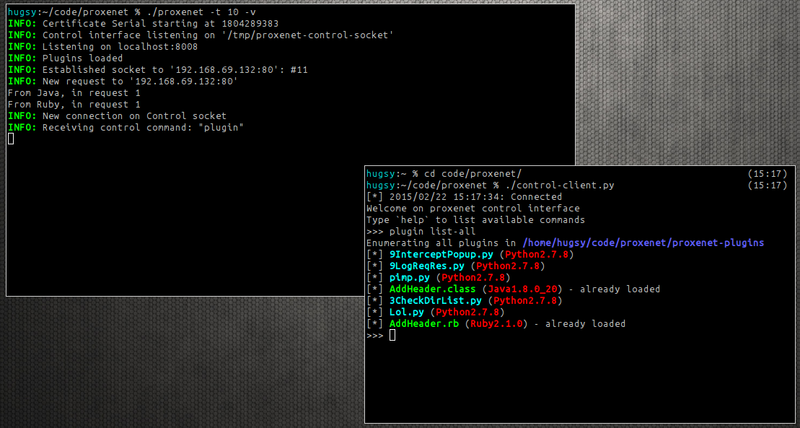 proxenet is a hacker friendly proxy for web application penetration tests. Simply put, proxenet will allow you to make fine grain plugins to manipulate HTTP requests and/or responses in the language of your choice; that other existing tools (Burp, ZAP, etc.) can by design never allow you to do. proxenet is a multi-threaded proxy which allows you to manipulate HTTP requests and responses using your favorite scripting language. No need to learn Java (like for Burp), or Python (like for mitmproxy). proxenet supports many languages (see the section "Language Versions") and more can be easily added. 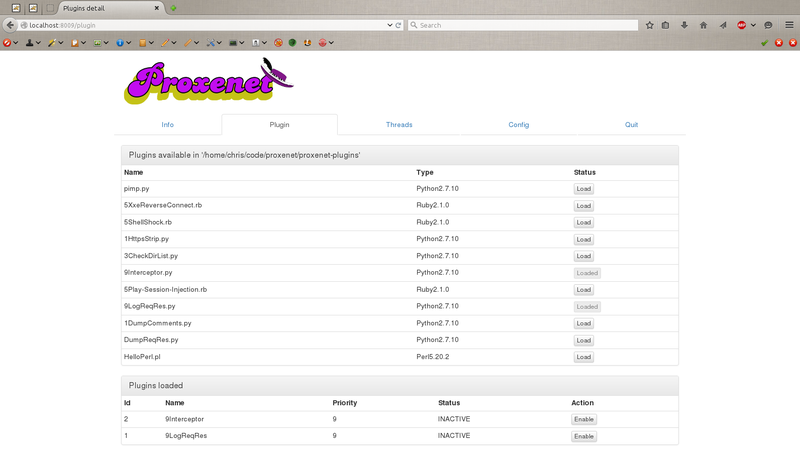 Of course, the best way is to write your own GUI as a proxenet plugin! The idea behind proxenet came after much frustration from attempting to write extensions for Burp. Moreover, only a few existing proxies support the possibility to add new extensions, and when they do, they typically only support one language. This is not ideal for a penetration tester, as it compromises usability despite Burp's persistent attempts to make unnatural bindings (Python over Java, or worse: Ruby over Java). Proxenet is written in pure C, so it is fast, efficient and easily pluggable to everything else. It is the ultimate real DIY web proxy for pentesters. 100% Open-Source ... and more! Some people might miss the beautiful interface some other GUI-friendly proxies provide. So be it! Chain proxenet along with Burp, Zap, Proxystrike, burst, etc. and enjoy the show! If you've ever had the pleasure, you already know that writing extension for Burp is a pain, and other tools only provide plugins, and when they do, only in the language they were written in. The simple and powerful idea behind proxenet is to allow pentesters to easily interact with HTTP requests/responses in their favorite high-level language. Take a look at the Plugins section for a quick guide on how to start writing plugins. Note: This troll is naturally totally unbiaised of course. Report crashes or improvement patches using the GitHub issues page of the project. This project follows the beers4bugs bounty policy.